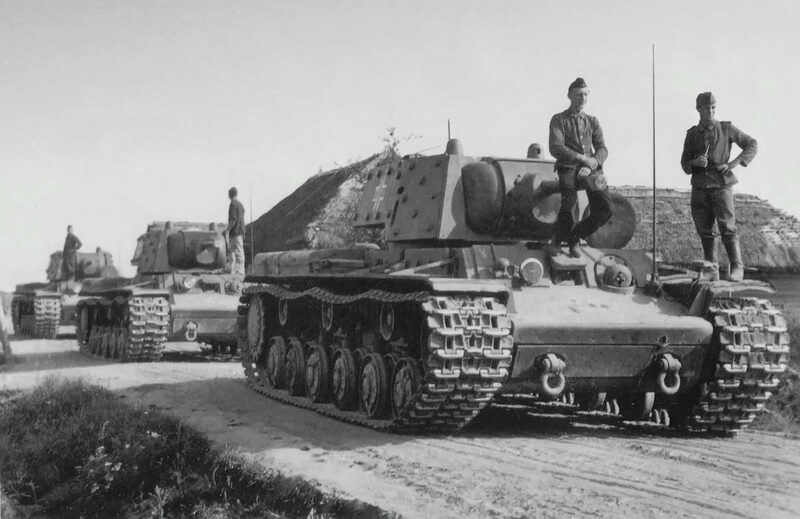 Captured Soviet KV-1E (shielded) heavy tanks from the 8th Panzer Division of the Wehrmacht. The tanks are equipped with radio stations and German identification marks. KV-1 in the foreground, produced in June 1941, was obtained by the 6th Tank Regiment of the Soviet 3rd Tank Division on the evening of July 3, 1941. Most likely, it was unloaded at Karamyshevo station near Pskov. The tank arrived with a factory crew and two ammunition sets. The crew was reinforced by the regimental commander and on the morning of July 5, 1941, went into battle. The tank attacked the bridgehead of the German 1st Panzer Division in Ostrov. KV-1 was damaged on the bridge over the river Vyazovnya in the village of Karpovo, near the northern edge of Ostrov at the exit of the battle.